(CAMARILLO, Calif.) June 19, 2017 - The Ventura County Community College District Board of Trustees held a public farewell reception for Chancellor Bernard Luskin during the June 13th Board Meeting at the District Administrative Center in Camarillo, California. The meeting was Luskin’s last public Board Meeting in his service as Chancellor of the Ventura County Community College District. Students, administrators, faculty, and members of the pubic were in attendance to honor Dr. Luskin for his dedicated service to the students of Ventura County and for his district and statewide leadership. During the meeting Board Members expressed appreciation and gratitude to the Chancellor for his service and accomplishments. “We are grateful that Dr. Luskin has been able to unite the District through his wisdom and leadership,” said Trustee Steve Blum, who has served on the Board since 2006. Trustee Larry Kennedy offered an analogy of the leadership of Dr. Luskin, likening him to a seven foot tall NBA player who arrives to rescue a struggling NBA team. Trustee Art Hernandez likened Dr. Luskin to the kind of leadership that Winston Churchill gave to the English peoples during World War II. Vice Chair Hernández further commented that “throughout the duration of his contract, Luskin helped the District and colleges realize their potential by initiating and completing multiple measures, including accreditation reaffirmation by the Accrediting Commission for Community and Junior Colleges, moving the District Office to its new centrally located building in Camarillo, hiring and stabilizing District and college leadership, and increasing contracts and grants throughout the county.” Furthermore, “Luskin opened many doors to increase student services and programs by creating more degree and certificate applications at Moorpark College, Oxnard College, and Ventura College. He was here when we needed him.” added Hernández. “Many do not realize how much Dr. Luskin was able to accomplish. He brought the District together and worked throughout the state in service to students,” said Trustee Dianne McKay. Dr. Luskin strengthened District relationships by opening regional educational pathways through strategic articulation agreements, K-12 pathways programs and in playing a key role in facilitating the creation of the California Community Colleges Veterans Caucus. Luskin’s oversight was unique in prioritizing non-traditional learning models such as dual enrollment and distance education to provide large student populations with greater access to education. In his closing remarks, Chancellor Luskin complimented the board of trustees noting that the VCCCD Trustees is considered one of the best boards of trustees in the California Community College System. At the close of the meeting, Board Chair Bernardo Perez testified to Luskin’s ability to establish relationships across the community and in business and government, at the national and local level. “This is evening is sentimental to me because I started as a student at Ventura College at age eighteen, and now I am Chancellor,” remarked Luskin. Chancellor Luskin shared his plans to stay in Ventura County and keep connected with the District even after his contract completion on June 30, 2107. “Everyone asks if I am going to retire.” “No.” he said. “I am going to ‘rewire’.” Luskin jovially proclaimed. Prior to serving as Chancellor of the Ventura County Community College District, Luskin served as President of Moorpark College and Oxnard College; he has served as CEO of Touro University Worldwide, Chancellor of Jones International University, President of Wright Graduate University; Orange Coast College, founding President of Coastline Community College and COO of the American Association of Community Colleges. Luskin will be succeeded by Dr. Greg Gillespie, current Ventura College President. The Ventura County Community College District is a member of the 113-campus California Community College system, and serves more than 50,000 students annually. The District’s three colleges- Moorpark, Oxnard, and Ventura- offer programs in general education for degrees and certificates, transfer to four-year colleges and universities, career technical education, and provide opportunities to engage in co-curricular campus activities. For more information, please visit www.vcccd.edu. Washington, D.C., August 10, 2016. Psychologist Bernard Luskin, Ed.D, Chancellor, Ventura County Community College District in California, and Past President of the APA Society for Media Psychology and Technology, has been elected by the APA Board of Directors and Council of Representatives as a fellow of the American Psychological Association “for his significant accomplishments and contributions to the field of psychology.” Luskin has been a media and counseling psychologist and college administrator for more than 30 years, serving as a psychology professor, business executive and college administrator. Luskin has provided leadership in organizational psychology as director and faculty member in higher education leadership programs, and as a media psychologist, having been founder of the first MA and Ph.D programs in Media Psychology and Ed.D programs in Media Studies and Community College Leadership at Fielding Graduate University. Luskin is author of nine books in psychology, leadership development, economics, business and information technology. He produced several hundred CD’s including the first interactive Sesame Street CD, Grolier’s and Compton’s Encyclopedias, Treasures of the Smithsonian and more. He served as executive producer of many online and telecourses, documentaries and educational programs, receiving two Emmy’s from the Academy of Television Arts and Sciences. Dr. Luskin has been CEO of eight colleges and universities, divisions of Fortune 500 media, publishing and telecommunications companies and professor of psychology, business and education. Bernie Luskin earned a doctoral degree in education and psychology from UCLA, an MA degree from California State University, Long Beach, a BA degree from California State University, Los Angeles and an AA degree from Long Beach City College. He is a licensed Marriage and Family Therapist and School Psychologist. Luskin received the UCLA Dean’s Scholar and Lifetime Achievement Awards in Education from the UCLA Graduate School of Education and Information Studies, a distinguished alumni award from CSULA, and is a member of the Hall of Fame of Long Beach City College. The American Psychological Association (APA), in Washington, D.C., is the largest scientific and professional organization representing psychology in the United States and is the world’s largest association of psychologists. APA’s membership includes more than 130,000 researchers, educators, clinicians, consultants and students. We congratulate Dr. Luskin on this important recognition and are pleased to have him with us in providing district leadership,” said VCCCD Board of Trustees Chair Larry Kennedy. Newswire, January 8, 2013, Los Angeles. “Dr. Bernard Luskin, internationally recognized learning psychologist and administrator in online and distance learning will Keynote the European Distance Education Network 2013 Annual Conference in Oslo, Norway in June 2013,” announced EDEN Secretary General Andras Szucs. “I applaud the mission and leadership of EDEN members to maximize the sharing of their academic and professional experience and knowledge to stay at the cutting-edge of new knowledge about access and opportunity in learning,” said Luskin. “EDEN is a UK based non-profit international educational association and the largest learning organization and conference in European education. Established in 1991, EDEN now has more than 200 institutions and 1200 individuals as members. “EDEN members offer outstanding leadership in e-learning, open and distance education. The theme of the Oslo conference is The Joy of Learning: Enhancing Learning Experience - Improving Learning Quality,” added Szucs. “I will analyze key questions in e-learning, open and distance education and to discuss best practices, creative methods, smart solutions and innovative developments in the context of learning, psychology and social media. I will explore new knowledge in media psychology that improves learner motivation, provides inspiration and enhances learner satisfaction leading to increased student success,” added Luskin. Dr. Bernard Luskin has been recognized with a life achievement award for contributions to media psychology by the American Psychological Association’s, Society for Media Psychology and Technology, and was recently named president-elect. Luskin also received life achievement awards for contributions to learning, education and media from the UCLA Doctoral Alumni Association, California State University, Los Angeles, The Futures Commission of the American Association of Community Colleges, the Irish Government and the European Commission. Luskin has served as distinguished professor of education and psychology in a number of universities and as CEO of four colleges and universities. While at Fielding Graduate University, he launched the first Master’s, Ph.D and Ed.D programs in media psychology and media studies in any university. Luskin publishes a regular column in Psychology Today Magazine titled, The Media Psychology Effect. WESTLAKE VILLAGE, Calif., July 18, 2011 /PRNewswire-US Newswire/ -- "Bernard Luskin will receive APA Media Psychology Division life achievement recognition for contributions to Media Psychology at a convention reception in Washington, D.C., on August 5, 2011," announced Dr. David Shapiro, Chair of the Awards Committee and former Division President. "Bernie Luskin has been active in media psychology for most of his professional career," said Rachel Bishar, recipient of the first Ph.D. from the first university doctoral degree program in Media Psychology. In 2002, we launched this first university Ph.D. program enrolling what we called, ‘The Magnificent Seven,’ meaning the seven MA, Ph.D. students who first pioneered this important and unique new graduate program in media psychology," said Bishar. "The master's degree, Ed.D. and Ph.D. programs we began at Fielding Graduate University were triggered by the 1998 APA Media Psychology Division Task Force report, Psychology and New Technologies, chaired by Dr. Lilli Friedland and me. The findings identified emerging professional areas of work where media psychology is emerging," Luskin explained. Since then M.A. and Ph.D. degree programs in Media and Communications Psychology have been started in other colleges and universities with Bernie's leadership, said Paul Wright, renowned entertainment and education attorney. 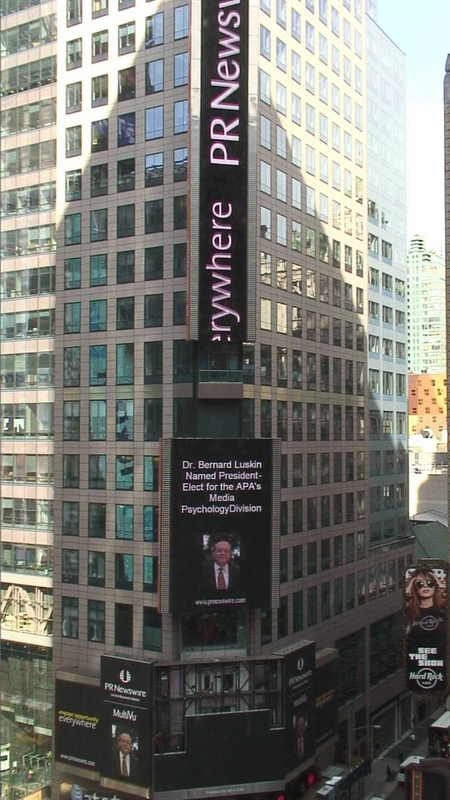 "Bernie Luskin has been developing the application of psychology to media and technology all of his professional life. We worked extensively together in the mid-nineties when Bernie was CEO of Philips Interactive Media. He developed the world’s first interactive CDs, producing titles in art, reference, games and movies. Those programs included the first Sesame Street CD, the first Compton's and Grolier's Encyclopedias on CD. He also put the first 50 feature films on CDs in a landmark deal with Paramount Studios," said Dr. Jean Pierre Isbouts, award-winning documentary writer and producer. Throughout his career, Bernie Luskin has served as president of Mind Extension University, a leading cable network dedicated to education, founding Chancellor of Jones International University and founding President of Coastline Community College, where he was central in the establishment of KOCE-TV. He helped to establish the PBS Adult Learning Service as a pioneer in distance education, online learning, and interactive media. "These innovative programs paved the way for education programming today. In fact, his work in applying behavior to interactive CD paved the way to DVD and digitally accessible movies," said Eric Doctorow, Executive VP and Home Video chief at Miramax Films. "My interest in psychology and technology began while I was experimenting with computer assisted instruction at Orange Coast College and completing a doctorate in Education and Technology at UCLA," explained Luskin. "I am honored to be acknowledged with this award and look forward to continuing to work in developing programs and understanding in media psychology," he said. 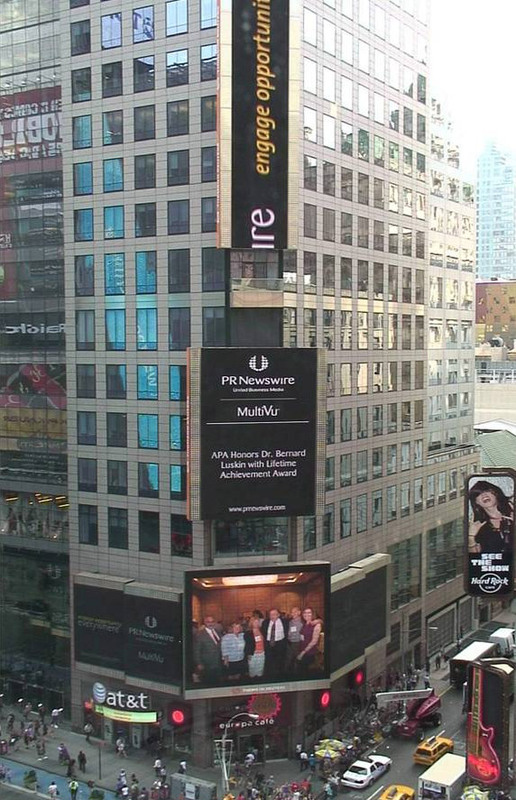 NY Times Square Jumbotron photo of Bernie Luskin receiving APA Life Achievement Award. From Left to Right: Scott Sobel, June Wilson, Jerri Lynn Hogg, Bernie Luskin, John Cabiria, Pamela Rutledge. Society of Media Psychology & Technology. WESTLAKE VILLAGE, Calif., August 15, 2012 /PRNewswire-USNewswire/ -- "Dr. Bernard Luskin, Professor of Media Psychology and Family Therapy, and CEO for Luskin International has been chosen President Elect for the Society of Media Psychology and Technology, Division 46 of the American Psychological Association," announced Dr. Mary Alvord, Elections Committee Chair. "Dr. Luskin has an exceptional history as a senior administrator, educator and leader in media psychology. He has made many outstanding contributions and pioneered new programs," said Dr. Judith Kuipers, President Emeritus of Fielding Graduate University. "While at FGU, Bernie Luskin developed and launched the first Master’s and Ph.D. degree programs in the field of Media Psychology and the first Ed.D. program in Media Studies in any university. He partnered Fielding with UCLA Extension to launch a successful master's degree program in Media Psychology and Social Change and has guided new master’s and doctoral degree programs in Media and Communications Psychology for other universities," said Kuipers. "Bernie Luskin has pioneered media psychology where ever he has been," said Glenn Jones, CEO of Jones International, Inc., and founder of Jones International University. "While at Jones, Bernie was central to the launch of Jones International University, the first accredited fully-online university. In addition, we began Mind Extension University, a precursor for many of the online university programs of today, including massive online education strategies that are now evolving into what are called MOOC strategies," added Jones. "Bernie and Dr. Lilli Friedland, co-directed Media Psychology and New Technologies, a major study for APA’s Division 46. That was a major milestone in shaping this cutting-edge field. He prolifically writes articles and blogs for several publications and produces cutting-edge online programs for universities and corporations, explained Dr. Toni Luskin, Program Director and Professor of Media Psychology at TUW. Author of ten books, several films, television series and interactive programs, Dr. Luskin won two Emmys from the Academy of Television Arts and Sciences, served as Chairman of the American Association of Community Colleges, president of Orange Coast College, Coastline Community College, and CEO of Philips Interactive Media, Inc., where spearheaded the landmark deal between Philips and Paramount Studios that brought the first 50 feature films to consumers in early DVD format. As a licensed marriage and family therapist and school psychologist, Bernie and I are now working within the American Association of Marriage and Family Therapy to foster applications of media psychology to improve global understanding of urgent family issues such as ADD, obesity, autism, depression, PTSD, addictions and other social-behavioral concerns now facing society," said Scott Sobel, President of Media and Communications Strategies, Inc. In addition to his lifetime achievement recognition by the APA’s Society of Media Psychology and Technology, Dr. Luskin has received lifetime achievement awards from the UCLA Doctoral Alumni Association, University of Florida, California State University, Los Angeles, Long Beach City College, the Irish Government and European Commission. "I look forward to continuing to contribute as President and Member of the Board of Directors of the Society for Media Psychology and Technology. This is a 21st century specialization whose time is now," said Dr. Luskin.